You can have tasty greens on your busiest days. Add a bit of ham, black-eyed peas or potatoes to dress them up. Heat oil in a large saucepan over medium-high heat. Cook ham 4 minutes or until beginning to brown. Stir in greens and water. Bring to a boil over high heat; reduce heat to medium-low. Simmer, covered, 10 to 15 minutes for flavors to develop. 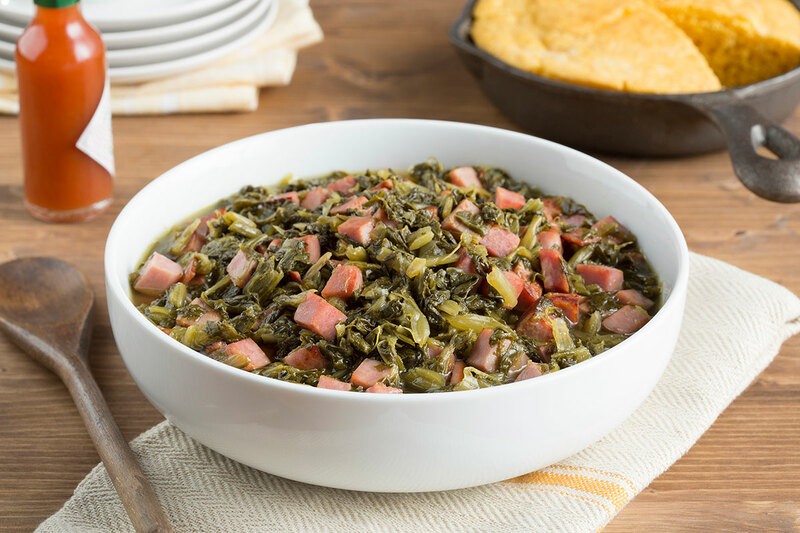 Skillet Greens and Black Eyed Peas – Omit ham. Cook 2 cups chopped onion with oil in Step 1. Add 1 can (15.5 oz.) Allens® Black Eyed Peas, rinsed and drained, with greens in Step 2. Omit water and cook, uncovered, 7 to 10 minutes over medium-low. Spicy Greens & Potatoes - Add 1 can (14.5 oz.) Del Monte® Diced New Potatoes, rinsed and drained with greens in Step 2. Omit water and cook, uncovered, 7 to 10 minutes over medium-low. Stir in hot sauce to taste, before serving. Creamed Greens - Omit oil, ham and water. Heat 2 tsp. sugar and greens, uncovered, over medium-low heat about 5 to 10 minutes. Remove from heat, stir in 1 pkg. (8 oz.) cream cheese, cut into bite-size pieces. Cover 3 minutes then stir until melted. Let stand 5 to 10 minutes to thicken.